Explores several themes on the transformation of consciousness in Savitri. 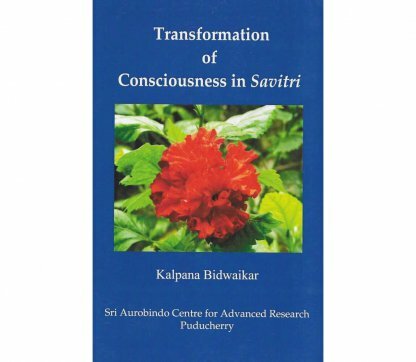 This book explores several themes on the transformation of consciousness in Savitri. It expounds Sri Aurobindo’s philosophy of the involution and evolution of consciousness and relates it specifically to the poem, citing passages from his major works and verses from the epic. It explores the different levels of human consciousness as seen in Savitri and explains the psychic and spiritual transformations experienced by Savitri and Ashwapati, leading ultimately to the supramental transformation and the creation of a new kind of being and a divinised life on earth. As we read and try to understand Sri Aurobindo’s works, especially three of his major works, Life Divine, The Synthesis of Yoga, and Savitri, vis-à-vis the ancient spiritual texts, the Vedas, the Upanishads, and the Gita, we tend to conclude that only he offers humanity redemption from the clutches of suffering, and even death, with the ransom of his great tapasya and its fruit of transformation. Whereas our past prophets and seers have given the solution of the world-riddle outside life and the world by escaping into nirvana or moksha, Sri Aurobindo presents the solution in the thick of life. For him nirvana is only “one radiant pace”, “only half God’s cosmic work”, only “the everlasting No”. Sri Aurobindo promises to take us to the land of “the Lover’s everlasting Yes”, where we can be fully liberated from the snare of Ignorance and transformed while living still in the midst of life. The means he presents to us for that cosmic journey is the transformation of consciousness, a radical change of our human nature into a divine nature, a complete reversal of our ignorant life into a divine life. This theme is the base and central idea of all his works, especially in the three books mentioned above. The Life Divine explains the theory, the rationale, the possibility of a divine life on earth against all scepticism and criticism. The Synthesis of Yoga is the manual, the guide map of practical steps across the uncharted route of transformation. Savitri is the drama of the actual enactment of transformation through the medium of mantric poetry played by cosmic actors Ashwapati, Savitri, Satyavan, and the Lord of Death. I feel the book under review, Transformation of Consciousness in “Savitri”by Dr Kalpana Bidwaiker, presents a harmonious fusion of the main aspects of Sri Aurobindo’s thought currents: the Real-Idea of a divine life, thedynamis of the integral transformation of human consciousness into divine nature, and the mantric power of future poetry. By discussing these points before she takes up the title theme, the author provides an appropriate backdrop to the main portrait. Sri Aurobindo has created Savitri not for the sake of poetry, but as a means for expressing his adventure of consciousness, his ascension to the highest peaks of existence. Such poetry is mantric, carrying the power and the force of the Spirit. It is indeed the poetry of the future. All the methods and conditions followed by him in the composition of Savitri have been laid down in his visionary and critical literary work The Future Poetry. In order to create such a poetry man must grow in consciousness, break the limitations of his mind, life, and body, undergo the disciplines of the Integral Yoga, and step into the shoes of Savitri and Ashwapati. This is the message of Savitri. And this very message is the theme of the book too. Unless we fully comprehend the concept of involution and evolution, the possibility of the transformation of man into superman remains untenable. Sri Aurobindo is the first thinker and scientist of consciousness, the first cosmologist to tell us in clear intelligible words the secret of the evolution of the world. He says that Matter or the Inconscient is not essentially different from the Spirit or the Superconscient. They are the two poles of the One Truth. It is the Divine who has plunged into the world of darkness and ignorance, the One has become Many. The Divine or the Spirit is involved in all things of the phenomenal world. This is the secret of the world’s evolution from matter to plant, from plant to animal, and from animal to man. Since the evolutionary process is ceaseless, the hidden superman is bound to emerge from the workshop of Nature. All these abstruse issues have been competently dealt with by the author, who has shown a flair for identifying appropriate verses from Savitri to support her arguments. Then she takes up the portrayal of the title theme, the transformation of consciousness in Savitri, in three successive chapters towards the end of the book. According to Sri Aurobindo the complete and radical transformation of man can be achieved by following a spiritual discipline in three stages: psychic transformation, spiritual transformation, and supramental transformation. The first step is achieved by finding one’s soul or psychic being, which is generally hidden behind the outer veils of mind, life and body, the surface actors under a shadowy entity called ego. The psychic being is a spark of the Divine, the indwelling God in the heart of man-ishwarah sarvabhutanam hriddeshe’arjun tishthati-that evolves from birth to birth and at last is capable of taking up the reins of man’s life and executing the will of God through its instruments. While the process of the psychic emerging as a master and ruler-swarat-can take a long time in the normal course of things, it can be accelerated by yoga and the result achieved in a relatively shorter time, even in a single birth. “For man thou seekst not for thyself alone. Savitri realized in her being the oneness of the Jivatman and the soul and it was the moment of the highest communion in her. The development of the psychic and the governance of the psychic on its instruments is of utmost importance in the integral transformation. The whole being has to rise higher in consciousness and, the higher has to descend into the lower for its transformation. The psychic change makes the being ready for the ascent and descent of consciousness for a spiritual transformation. Savitri too after having realized the psychic transformation, experiences a descent of the Divine Mother in her being. Man too shall turn towards the Spirit’s call. The last chapter of the book dwells on the rich spiritual import of the epic, which will serve as humanity’s guide and help towards the creation of the future man. Savitri is not only Sri Aurobindo’s spiritual autobiography but also his spiritual body, and it radiates his physical presence and power. The book is obviously the result of deep study and creative research work and opens a “lucent window” on the light and force brought down by Sri Aurobindo through the cosmic vision of Savitri. I am sure this book will inspire many more discoveries from the fathomless ocean of Savitri’s depths. Beautifully printed, it is quite handy at just 200 pages and reasonably priced too. Dwarika Prasad previously edited two magazines, Sri Aurobindo Karmadhara in Hindi and The Call Beyond in English published by the Sri Aurobindo Ashram–Delhi Branch, where the Mother had appointed him Manager. He currently works in Pondicherry for the Reception Service of the Ashram.